An American Optical infinity corrected x10 plan objective with a numerical aperture of 0.25. Condition very good, standard RMS screw thread. A good example of a x100 oil immersion lens from this quality American company. Infinity corrected with a numerical aperture of 1.25. RMS screw thread. In very good condition this is an R J Beck 2mm objective and assumed to be an oil immersion lens. Finished in two tone black and brass. Standard RMS thread. This is a Watson vintage objective 1.5 inch focal length which is roughly equivalent to a x10 objective. Finished in brass and with its original case. Condition excellent. This is a Wild H1 x100 oil immersion objective in very good condition with a numerical aperture of 1.25. Suits M20 biological microscope. A Wild Hi x50 oil immersion objective from a Wild M20 microscope with a numerical aperture of 0.10. 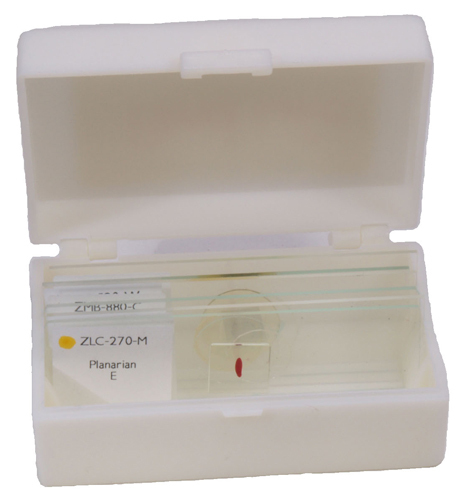 Ideal for blood film examination. Good condition. An excellent Vickers x40 objective. 160mm tube length and a numerical aperture of 0.65. A good lens at a good price. 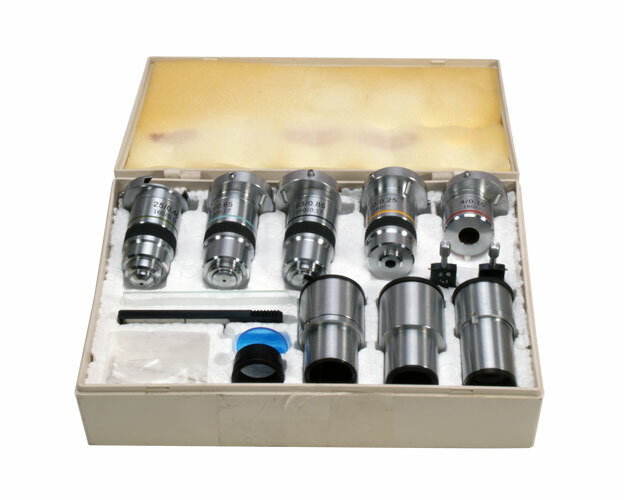 Officine Galileo was an Italian manufacturer of high quality and robust microscopes based in Milan and had a significant effect on the European microscope market during the middle of the last century. This is a very elegant looking lens finished in pale brushed brass. 4mm (x45) magnification with a numerical aperture of 0.95. 160mm tube length with a coverslip thickness correction collar. Condition excellent. This is a collectors item. A black and brass 4mm objective by Beck. Probably dating from the 1930’s or so. Condition good. Barbier, Bernard and Turenne were a French company that made quality optical equipment during the first half of the last century. They badged their equipment BBT Kraus. This is a x60 objective finished in two tone chrome and brass in excellent condition. 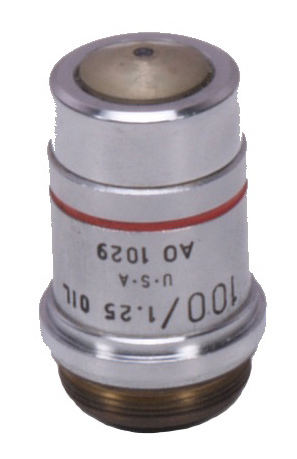 Standard RMS screw thread. This is a short x5 Gillett and Sibert achromatic objective with a numerical aperture of 0.15. 160mm tube length aith a standard RMS screw thread. In good condition for its age, this is a classic x40 Watson objective para x40 (67358) with a numerical aperture of 0.70. Complete with original objective case. A RMS screw thread ‘objective’ style fluorescence target. Essential for the centring of Hg fluorescence lamps. In very good condition for its age this is one of the classic Leitz objectives. 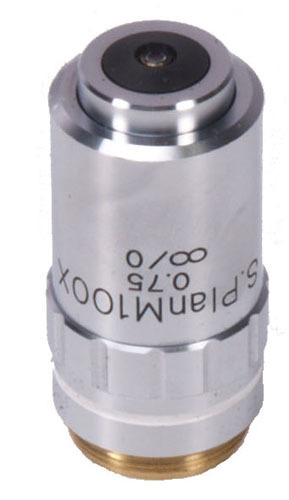 An oil immersion x54 with a numerical aperture of 0.95. 170mm tube length and coverslip corrected. In good condition this is a vintage Baker x14 (½”) objective finished in chrome. 160mm tube length and a numerical aperture of 0.35. In very good condition this is a Vickers x10 phase contrast objective. 160mm tube length and with standard RMS screw thread. An excellent Apo corrected Leitz objective lens..16mm 12:1. Numerical aperture 0.30. This is an exceptional lens from the zenith of the Leitz (now Leica) production period. Condition excellent. A x40 apochromatic lens with a high numerical aperture of 0.95 and a coverslip correction collar. Standard RMS screw thread and 170mm tube length. 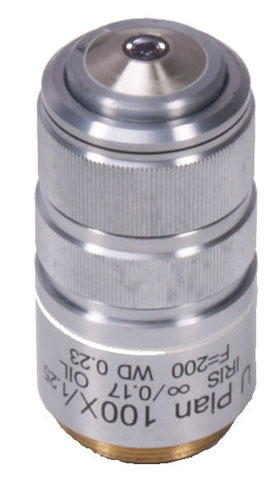 A Leitz 170mm tube length x2.5 plan objective with a standard RMS screw thread and a numerical aperture of 0.08. Condition very good. A good example of this classic Vickers Microplan x100 oil immersion objective. 160mm tube length with a numerical aperture of 1.25. Standard RMS screw thread. In very good condition this is an achromatic x6 objective with a numerical aperture of 0.15. In good condition, this is a Watson Para 16mm objective which gives an approximate magnification of x10. In very good condition this is a Microplan x10 phase contrast objective in very good condition. Numerical aperture of 0.25. Tube length 160mm. In good condition this is a Beck DIN standard x100 oil immersion phase contrast objective. Numerical aperture of 1.30. Tube length 160mm. This is a x4 infinity corrected plan objective by Reichert, with a numerical aperture of 0.12. Condition is excellent..
Kyowa are a Japanese microscope manufacturer of repute and this is a x100 oil immersion objective with an internal iris diaphragm. 160mm tube length with a numerical aperture of 1.25. Good condition. These are four objectives that fit the dovetail of the Reichert Zetopan Polarising microscope. x11 (n.a. 0.25), x32 (n.a. 0.65), x60 dry (n.a. 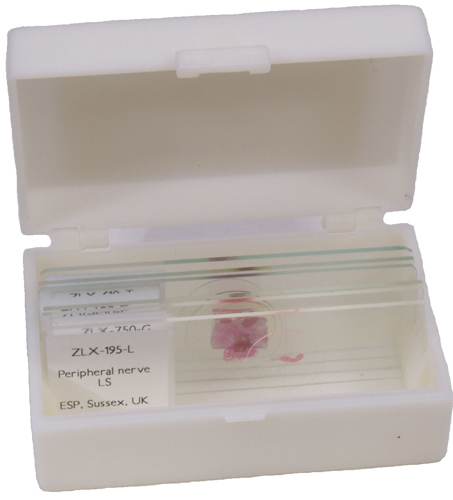 0.75) and x60 (oil immersion) (n.a. 0.95), Condition excellent. A set of four infinity corrected plan objectives. x2.5 (0.07), x10 (0.25), x40 (0.65) and x100 (1.25). These objectives are new and therefore in pristine condition. 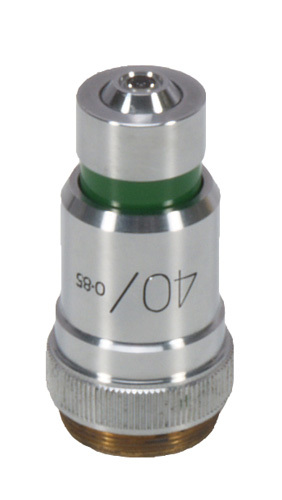 Standard RMS screw thread. A Carl Zeiss x6.3 objective with a numerical aperture of 0.16. It was originally from a polarising microscope which ensured it had a strain free lens system. 160mm tube length. Microplan objectives were the best that Vickers produced over the years that they made microscopes. This example is in very good condition. x10 with a numerical aperture of 0.25. 160mm tube length with a standard RMS screw thread. This is a Leica x4 objective with a numerical aperture of 0.10. 160mm tube length with a standard RMS screw thread.